I’m sitting in the library. Sunlight drifts in through the window, falling silently on my desk. Library attendants shuffle quietly about the carpeted room, and the familiar click of keyboards resonates from thirty feet away. 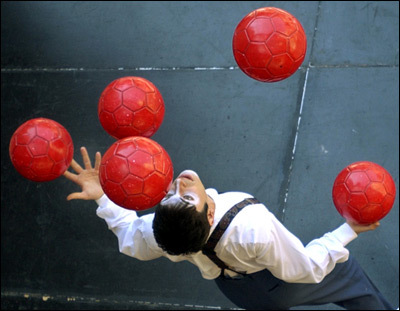 Oftentimes, I feel like I’m juggling. I feel like it’s taking all my effort and concentration to keep these four balls, or bowling pins, or maybe even knives, in the air. And people are watching me. People are watching me juggle these balls with amazing poise and concentration. I’m probably somewhere like Venice Beach or Key West late in the evening, and the sun is almost down but long arms of light still embrace this part of the earth. Twenty yards from me is the silver painted robot dancer man, and Michael Jackson is blaring next to him. There’s a bigger crowd down there, but right now I’m juggling my knives and eating an apple, and a few families show interest. These families have young kids who are spooked by the robot man. My girlfriend Brooke says that when you juggle you don’t look at each object but at a fixed point right above you, where the objects pass. So I’m juggling and have a small crowd when the robot man ends his dance and his crowd breaks up. Since I’m closest at least two-thirds of the people start coming my way, gawking as they pass or stopping to watch. My apple is almost gone and I’m going to stick the core onto a knife while keeping the other knives in the air. I’m also shouting something between mouthfuls about my need for a little crowd noise for this next part. All this is happening when I suddenly realize something greatly embarrassing – like my pants are inexplicably unbuckled and ready to fall to my ankles. And I didn’t have clean boxers so I’m wearing tighty-whities. I’m mortified at the idea of my pants falling, at the idea of the toddler in the pink dress with a happy birthday balloon forever scarred by the unexpected appearance of my pasty-white thighs, of parents shaking their heads in disgust as they walk away, shrieking young ones in tow. I feel like this juggler because often it seems that most of my life looks great, is going great, except one small thing sits there on the horizon, or the in back of my head, or in this case, the pit of my stomach. I think of how well things are going and it all would be perfect if only something else took care of itself. Something like I know what I’d be doing in two months, or where I’m going to get the money to pay back my parents, or if I would ever write thank-you letters on time. Usually this something is a thing I need to do and put off, or know I want to do but refuse to draw on the disciplines needed to do it. I find it odd that most people I talk to about this think the same way. Maybe they don’t realize they’re juggling. But they say things such as, “After this, life will get back to normal,” or “Once I start ______, then things will be a lot better.” The sad thing is that life doesn’t become normal. There is no normalcy to life. Life is ugly and beautiful. It spills out over the edges and onto your paper. It leaks like a bad pen, or doesn’t write at all. And we all try to juggle our way through it, fitting it neatly into time and space, letting the knives fall neatly into our hands without ever getting hurt. But oftentimes we take our eyes off the knife, if only for a split-second; we lose our perspective. Our timing is off. And I watched the knife because I got nervous since my pants were ready to fall down. The tip of the knife blade touches my hand before crashing to the ground. For a moment, nothing happens. Nothing. Then, a sudden flow of blood fills my palm and I instinctively squeeze it closed, blood dripping onto the pavement. The crowd gasps. Or sighs. Most people begin to hurriedly move away – knowing that blood is not part of the show. Knowing a toddler in a pink dress doesn’t need to be near knives on the ground, or the man with the bloody hand. And then my pants fall down. There I stand, in front of an ever-more-hurrying crowd, a few laughs emanating from the robot man 20 yards away. I stand unadorned, uncovered, unentertaining. I stand with life literally spilling out of my hand. I wonder why I kept juggling. Why did I keep going instead of stopping, apologizing, fixing my pants? Why wouldn’t I let people know that life spills like a toddler carrying a bucket of paint? Why should it surprise anyone that I’m not perfect? Why do I think that life should play by my rules, according to my time, where I have complete control? Why do I so often take my eyes off that fixed point that I know I need to gaze at in order to keep things up in the air? Because that’s what attracted me to juggling in the first place – the fact that while everything seems haphazard and out of control it’s really all orderly. It really all makes sense. All you have to do is look in the right place, and things suddenly don’t appear as daunting. I sit here in the library knowing I can’t juggle and probably never will. But I can imagine it. I sit here knowing how it feels to let the knives come crashing down. I know how it feels to be confused and not in control. I know that life will spill over and throw me up and down – will make me bleed. And somehow — not that I’m completely okay with this life running around as it does — I nod my head and accept it. Even embrace it. For standing there with a bloody hand, just having pulled my pants up, a young girl in a pink dress slowly totters up to me. She smiles and her dimples wink at me for a moment before disappearing. Slowly she reaches forward, holding her balloon. I look blankly at her. She thrusts the balloon closer to me. Slowly, unwillingly, I reach for it. I grab the string and the balloon nods gently in the wind. The girl looks at me with large brown eyes, a pink dress with ice cream on it from earlier that day, and hair that falls to her shoulders in tight curls. She turns and toddles off, leading her father away. And I stand there, dumbstruck, holding the balloon tightly. as a juggler, or a performer, as we in the business like to say, i know to always keep my eyes on a fixed spot above me, or the game is over. my life, frankly, depends upon my juggling. it seems silly to say, but it is true. especially when i am dealing with knives. when i am dealing with knives, it is not only my life, but the life of everyone around me, too. the people on the streets do not understand the significance of this. they come up to me while i am juggling and start talking to me. i love the people, especially those who put money in my hat, but i cannot talk and juggle at the same time. i do. i always end up talking and juggling at the same time. i don’t want to be rude or seem uncaring. i like talking to them and hearing about their lives, i really do, but the juggling just takes so much effort and concentration; i don’t do both at the same time very well. my life and theirs…i have to weigh the two. i wish i could talk to them some time when i wasn’t juggling, but i am always juggling, even in my sleep. one day there was an old woman who walked by. she stopped for a moment, right next to my hat, looked at my brilliant juggling, and walked away without even a smile. i thought, maybe i am not such a good juggler as i think i am. or maybe she is just a strange old woman. maybe, she had somewhere to be, and getting the money out would have taken too long. and then it came to me, maybe my juggling just wasn’t that important to her. what did it do for her? or anyone, really? it entertained a few people, yes, but in the end, it was all empty. even when they laughed, i had noticed, it was hollow and they made a sound sort of like a pig in a pen trying to lose his soul before they kill him. so, i caught the knives i was juggling, in an orderly manner, and tucked them away. i took my eyes off that fixed spot above me and, to my surprise, nothing came crashing down; actually, it felt rather wonderful. for the first time i could see the faces of the people gathered around me. they looked at me curiously. they were surprised and unsure of themselves. some of them expected me to get out knew and better knives. they waited, but i did not get any knew knives out. and if that was surprising to them, i can’t imagine how they felt when i just walked away, leaving my hat in the middle of the walkway and everything. i found the old woman who had walked by my show earlier. i sat next to her in a garden on a little bench. she offered me part of her sandwich. i accepted and we ate together. she smiled.